Chiang Mai (Thai: เชียงใหม่, pronounced [t͡ɕʰīaŋ.màj]; Lanna: ᨩ᩠ᨿᨦᩉᩲ᩠ᨾ᩵, pronounced [tɕiaŋ.màj]) is the second-largest province (changwat) of Thailand. It is in the country's north. 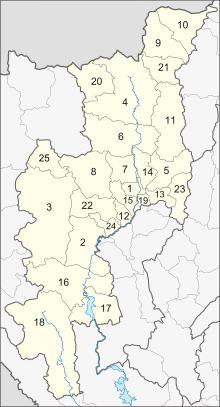 It is bordered by Chiang Rai to the northeast, Lampang and Lamphun to the south, Tak to the southwest, Mae Hong Son to the west, and Shan State of Burma to the north. The capital, Chiang Mai, is 685 km north of Bangkok. 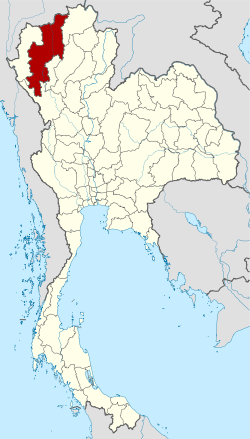 Chiang Mai Province is about 685 km (426 mi) from Bangkok in the Mae Ping River basin and is on average at 300 m (1,000 ft) elevation. Surrounded by the mountain ranges of the Thai highlands, it covers an area of approximately 20,107 km2 (8,000 sq mi). The mountains of the Daen Lao Range (ทิวเขาแดนลาว) at the north end of the province, the Thanon Thong Chai Range (เทือกเขาถนนธงชัย) stretching in a north-south direction, and the Khun Tan Range in the east of the province are covered by rain forest. The Mae Ping, one of the major tributaries of the Chao Phraya River, originates in the Daen Lao mountains. 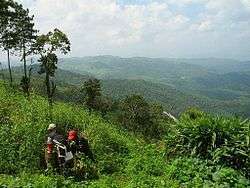 The highest mountain in Thailand, Doi Inthanon at 2,565 metres (8,415 ft), is in Chiang Mai Province. Several other national parks are also in the province: Doi Suthep-Pui, Ob Luang, Sri Lanna, Huai Nam Dang, Mae Wang, and Pha Daeng. In 1599, the kingdom lost its independence and became part of the Ayutthaya Kingdom. 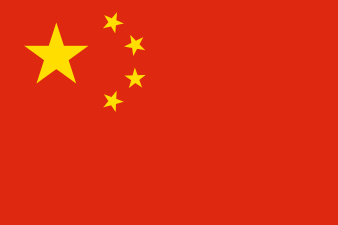 This ended the dynasty founded by King Meng Rai, an era that last 300 years. The Burmese occupiers, had a powerful Burmese influence on the architecture which can still be seen today. It was only in the late 18th century that Burma was finally defeated with the leadership of King Taksin. 13.4% of the population in the province are members of hill tribes, among them the Hmong, Yao, Lahu, Lisu, Akha, and Karen. 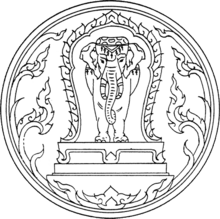 The seal of the province shows a white elephant in a glass pavilion. The white elephant is a royal symbol in Thailand, and it is depicted to remember the offering of a white elephant by Thammalangka, a ruler of Chiang Mai, to his overlord, King Rama II of Bangkok. The pavilion symbolizes that Buddhism prospered in Chiang Mai, especially when in 1477 the teachings of Buddha, the Tripitaka, were reviewed. The provincial flower and tree is the "flame of the forest" (Butea monosperma). The provincial slogan is In the shadow of Mount Doi Suthep, blessed with rice customs and traditions, beautiful wild flowers, magnificent Nakhon Phing. 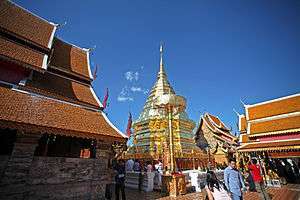 Chiang Mai is subdivided into 25 districts (amphoe). The districts are further subdivided into 204 subdistricts (tambon) and 2,066 villages (muban). 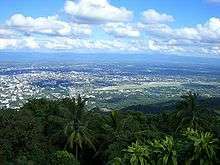 Chiang Mai has a tropical wet and dry climate (Köppen Aw), tempered by the low latitude and moderate elevation, with warm to hot weather year-round, though nighttime conditions during the dry season can be cool and are much lower than daytime highs. The maximum temperature ever recorded is 42.4 °C in May 2005. Car. Chiang Mai is on Highway 11 (Super Highway Rd). Train. Chiang Mai is the northern terminus of the northern railway route. Samlor. Samlors (rickshaws) can be found in the urban core. Tuk-tuks are used for short distances. Buses. Chiang Mai is served by buses from Bangkok and many other cities. Bicycle and motorbike. Both forms of transport can be hired in Chiang Mai city. Air. 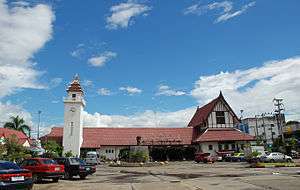 Chiang Mai International Airport (CNX) is one of the seven Thai international airports under the aegis of the Airports of Thailand Public Company Limited (AOT). 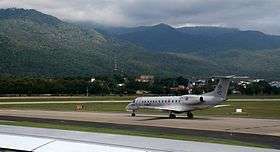 As Chiang Mai International Airport is the major gateway to northern Thailand, it plays an important role in promoting travel and tourism throughout the northern region. Today, 14 airlines serve the airport and more than 3,000,000 passengers, 15,000 flights, and 16,000 tons of cargo are handled annually. Chiang Mai Province is the tourist hub of the north and one of Thailand's most important tourist destinations.It is considered one of the most scenic provinces in the country due to its mountain ranges, valleys, flora, and fauna. Unlike most of Thailand, in some months the climate in the north and Chiang Mai is cool, fresh, and misty. Chiang Mai is a handicrafts centre, with a variety of antiques, silver jewellery, and embroidery, Thai silks and cottons, basketry, celadon, silverware, furniture, lacquerware, woodcarvings, and parasols. 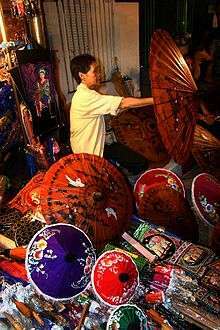 Umbrellas/ parasols: These are inextricably associated with Bo Sang where villagers have been engaged in their manufacture for at least 200 years. All materials, silks, cottons, Sa paper (manufactured from the bark of the mulberry tree), and bamboo are produced or found locally. Silverware: Traditional skills and a guaranteed content of at least 92.5% pure silver invest bowls, receptacles, and decorative items. Lacquer ware: Made of wood, bamboo, metal, paper, and baked clay, in the form of receptacles, ornaments, and various souvenirs. Furniture/ woodcarving: Major woods and materials include teak, rosewood, and rattan. Items may be unadorned or, especially with teak and rosewood, carved in traditional or modern designs. Woodcarving is a traditional northern Thai art featured in numerous temples. In recent years, woodcarving has increasingly embellished furniture, gracing screens, chairs, tables, beds, figurines, carved elephants. Hilltribe products: These include silver ornaments, bracelets, necklaces, pendants, and pipes of intricate design, and embroidered items including tunics, jackets, bags, purses, caps, and dresses. Gold plated orchids and butterflies: Orchids and butterflies are preserved and plated with 24-carat gold to create unusual gift items such as necklace pendants, hairpins, and earrings. Pottery: Products include high-fired Celadon which is produced in many forms, including dinner sets, lamp bases, and decorative items. Sa (mulberry) paper products: Sa products that come in different, distinctive designs include cards, notebooks, stationery, boxes, bags, photo frames, lanterns, gift wrapping paper. 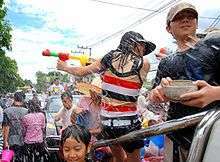 The north of Thailand's culture is Lanna in origin and the people are proud of their northern roots. The region is home to distinctive foods, music, arts, way of life, and even language. Chiang Mai is home to various hill tribes and their own distinctive cultures. Akha the largest population of any hilltribe in the region. Originating from Tibet and Southern China, they dwell on high ground around 1,200 meters above sea-level. Within their villages they build a spirit gateway to protect them from evil spirits. Hmong from southern China. Prefer higher elevations. 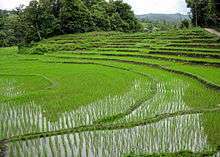 They raise livestock and grow rice, corn, tobacco, and cabbage. Known for their embroidery and silver. Karen occupy valleys and riverbanks. Lahu from southern China and live in high areas. They are known as hunters and planters. Lisu from southern China and Tibet are renowned for their colorful dress and also build their dwellings on high poles. They harvest rice and corn and their men are skilled in hunting. Tai Lue live in dwellings of usually only a single room wooden house built on high poles. They are skilled in weaving. Tai Yai, Burmese in origin, harvest rice, farm, raise cattle and trade. Their craftsmanship lies in weaving, pottery, wood carving and bronze ware. Yao reside on mountainsides and grow corn and other crops. They are skilled blacksmiths, silversmiths and embroiders. Nam phrik ong is a type of Nam phrik chili paste which is made of minced pork and tomatoes. It is usually eaten with soft-boiled vegetables, pork crackling, or deep-fried crunchy rice cakes. Nam phrik num meaning "chili paste young man", is another kind of paste which can be eaten with pork crackling. Sai ua is a local sausage that is very aromatic and spicy and is usually eaten with sticky rice. Kaeng meaning "curry", is not made with coconut milk in the north. Kaeng khae is a spicy curry consisting mainly of vegetables. Khanom chin nam ngiao is a traditional northern noodle dish with chicken or pork. 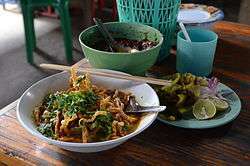 Khao soi is a noodle dish which can be made from chicken, pork, or beef made with coconut milk and garnished with chopped fresh shallots, pickled cabbage, chilli paste to taste, and a slice of fresh lime. There are two main sport stadia in Chiang Mai and its environs: 700 Year Stadium and Province Stadium. 700 Years Stadium is on Klongchonpratan Road, 7 km (4.3 mi) from Chiang Mai University. There are swimming pools, diving pool, basketball arena, and 11 tennis courts. The province is twinned with eight cities. ↑ "Doi Inthanon National Park". Tourist Authority of Thailand (TAT). Retrieved 21 Mar 2015. 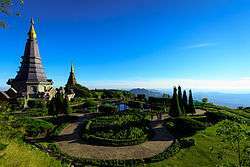 ↑ "Doi Suthep-Pui National Park". Department of National Parks (DNP) Thailand. Retrieved 24 May 2015. ↑ "Ob Luang National Park". Department of National Parks (DNP) Thailand. Retrieved 24 May 2015. ↑ "Si Lanna National Park". Department of National Parks (DNP) Thailand. Retrieved 24 May 2015. ↑ "Huai Nam Dang National Park". Tourism Authority of Thailand (TAT). Retrieved 21 Mar 2015. ↑ "Mae Wang National Park". Department of National Parks (DNP) Thailand. Archived from the original on 12 February 2015. Retrieved 24 May 2015. 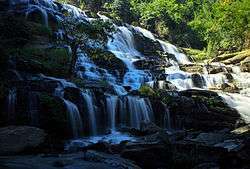 ↑ "Pha Daeng National Park". Department of National Parks (DNP) Thailand. Retrieved 24 May 2015. 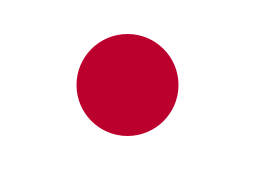 ↑ "Chiang Mai". Tourism Authority of Thailand (TAT). Retrieved 21 Mar 2015. 1 2 3 "Geography". Chiang Mai Provincial Administrative Organization. ↑ "Chiang Mai International Airport". Airports of Thailand Public Co., Ltd. Retrieved 24 May 2015. ↑ "Shopping Chiang Mai". Tourism Authority of Thailand (TAT). Retrieved 24 May 2015. Wikimedia Commons has media related to Chiang Mai Province.